It was a year ago Monday that I launched this blog with three posts, the first of which alluded to mine being one of 50 million or so. Now Technorati says there are something over 70 million non-spam blogs. As you look in the archives, you’ll note that my first posts were on July 30, 2006 and then I went dark until September 21. I wasn’t sure it would really be “OK” to have a blog, but then I got the responsibility for New Media as part of my work portfolio, so I decided to really plunge in and learn. Since then I’ve done 212 other posts, or nearly two every three days. Here are some highlights, themes and lessons learned from my first year of blogging. I’ve done several book reviews, including The Tipping Point and Blink! by Malcolm Gladwell, Our Iceberg is Melting by John Kotter, I Dare You! by William Danforth, Pyromarketing by Greg Stielstra, Wikinomics and, most recently, Made to Stick. I recommend all of them. One book I didn’t review, but which has been the concept behind many posts, is David Allen’s Getting Things Done. Click here to read my thoughts on GTD. I’ve blogged, some of them live, several conferences and seminars, including a Ragan conference in Chicago (where I met Jeremiah), the WHPRMS conference for health-care PR and marketing professionals, an Advanced Learning Institute conference in October, and a similar one in April. More recently, a colleague and I attended and presented at a healthcare marketing conference in Orlando, and last week I was on a panel at the Frost & Sullivan Sales & Marketing East 2007 event. Liveblogging is a great way to take notes on presentations, so I can refer to sites mentioned by the presenters. If it helps others, that’s a nice bonus. I discovered that my blog was a great place to share personal and family highlights, from our Bible Bowl vacation, to my daughter Rachel’s wedding, to our electronic, multimedia Christmas letter. On the media front, this has been the year of the buyout and layoff, particularly with newspapers. That has lots of implications for people like me who work with news media. My biggest surprise, though, was a post on a related topic, when Dr. Max Gomez lost his position as the on-air doctor at WNBC. I began to notice that this post was getting visits every day, even several months after I wrote it. Then I noted that my WordPress.com dashboard was telling me that “Dr. 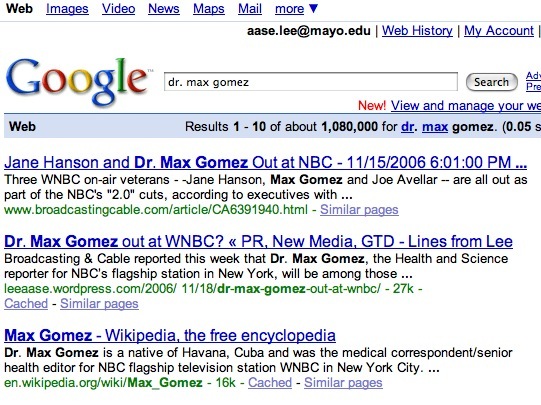 Max Gomez” was a phrase people were using to find my blog. I thought, wow, are people searching for Dr. Max Gomez on Technorati? That must be how people are finding it, right? Somehow my blog post ranked ahead of Wikipedia’s entry on Dr. Max in Google! I found something similar with my review of John Kotter’s penguin parable. Which just does go to show that blogs are naturally built for search optimization. Most recently, I’ve been amazed by Facebook, which has led to several other posts. It’s been a great year of learning, and while I’ve invested some time, the financial cost has been zero. Where else but the blogosphere can you learn so much at no cost? I’m looking forward to continuing my education!